Inspired by traditional Turkish carpets, this travel-ready pouch stows your favorite accessories. Modeled after traditional Turkish carpets, this colorful pouch stows your favorite jewelry in zippered pockets, while a snap-style ring holder and a large interior slip pocket with a tether keeps uniquely shaped pieces in line. This design rolls up and secures with a ribbon to keep accessories safe while you travel the world, or just to mom's house. Handmade in Turkey. I bought this 3 times now. my daughter is moving to the UK and will be traveling around Europe. I use mine to travel back and forth also. I really was excited to give this as a birthday gift to a good friend who travels constantly. 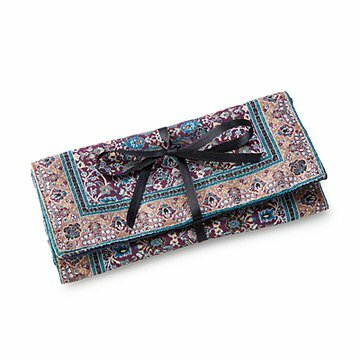 The jewelry roll "rug" is adorable and sturdy with a good amount of room... it's the ribbon tie that is flimsy and not long enough to wrap around the rug and hold it securely, which defeats the whole purpose. Disappointed in the quality, I passed on sending this to my friend. I bought two for my nieces and they absolutely loved. I'm thinking of purchasing one for myself now. Fantastic quality, beautiful, and unique. It is very useful and small (perfect for traveling) which I also love. I would buy this product again. It's lovely. It will be great for travel. My sister in law loves this item and said it would be perfect to use when she travels. I included this as part of a travel gift pack for my sister-in-law - she loved it! Shipping was prompt and the roll was exactly as described and pictured. Great gift, just a beautiful as pictured! The detail was beautiful and price was affordable, I'd buy it again for friends or myself!